Children with Down syndrome do not experience global delay: research has found that different aspects of their development are affected differently by the condition. However, does this mean these outcomes are fixed? 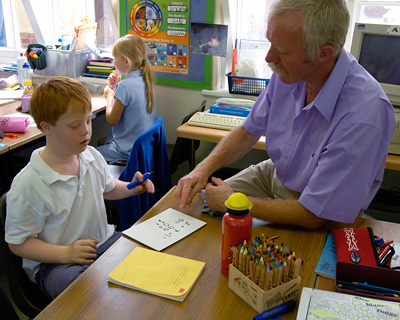 Educational research has shown that although the development of children with Down syndrome is usually delayed (relative to other children of the same age), not all areas of development are delayed to the same extent. Are these outcomes the unavoidable consequence of an additional copy of chromosome 21? Or, can they be changed with better therapies, intervention and support? As the research has shown these specific weaknesses are a risk for children with Down syndrome, practitioners have focused on interventions for these difficulties from the early years. Speech and language therapy has become a priority from infancy using visual supports such as pictures, signs, print and software to compensate for verbal short term memory weaknesses. Teachers now use visual supports and adapt the way teaching, learning and assessments are carried out in schools. Teachers are also focusing on speech and language development as a priority in the curriculum. Games and activities are being used to try improve memory development. More children with Down syndrome are being educated in mainstream schools. Buckley SJ, Bird G, Sacks B. (2006) Evidence that we can change the profile from a study of inclusive education. Down Syndrome Research and Practice. 9(3) 51-53.